Ms. Hoover takes us on another emotional journey. 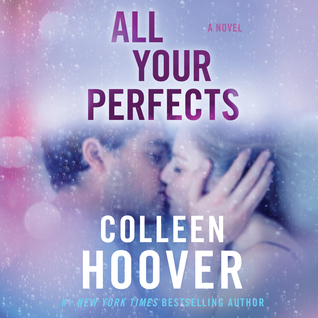 All Your Perfects was unique and heart-breakingly beautiful; majority of the time in romance novels we are watching a couple fall in love, All Your Perfects is so much more than falling in love. It's staying in love, fighting for that love and never giving up on that love, battling the category 6 hurricane as a team. Life isn’t always fair more often than not its cruel to the best of people. AYP shines a light on an issue that affects so many, one that many of us think nothing about. Because of the ignorance we often ask questions that aren’t intended to be hurtful or painful, but they are. “If you only shine light on your flaws, all your perfects will dim”. Colleen gives us what appears to be the perfect couple. We flip between past and present, allowing us the opportunity to watch them fall in love and out of love with each chapter. I think that’s what boke my heart the most in this book; they were so in love, perfect for each other than BAM the next chapter has us looking at everything that’s going wrong vs what good they still have in their marriage. I will admit that I wished that this story would’ve ended differently but that is life, we don’t always get what we want. We need to learn to make the most and best of what we have. Thanks for your review Terri! This is probably my favorite book of 2018. If you’re a CoHo fan, this doesn’t disappoint. If you’ve never read one of her books, this is a good one to start with.